If you ever have the chance to visit the AdamsGabbert office, you’ll see a bunch of kind and dedicated humans, working hard to help other businesses succeed. You’ll see office supplies and meeting rooms, but you might also see a big brown fluff ball of cuteness. That’d be me. 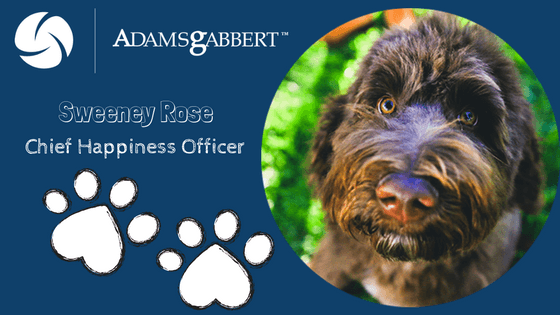 Sweeney Rose—a chocolate brown Goldendoodle and Chief Happiness Officer for AG. Don’t let my luxurious fur and heart-melting eyes fool you. I may be adorable, but I have an important job that I take very seriously. The humans I work with have a lot of important work to do each day. They spend a lot of time talking strategy and connecting with their clients, so I make sure I’m there when they need a moment to relax. I use my cuteness for good, making myself available for petting and head scratching whenever someone might need it. A main part of my role as CHO is to welcome people as they enter the office. You’ll often find me hanging out in a chair by the entrance, ready to wag my tail at visitors. And if someone leaves the office throughout the day, I’ll wait for them by the door until they get back. Another thing I like to do is give hugs. I’m talking full-on, paws on shoulders, nuzzle to nose human hugs. My current project at the office is the Ball Inspection Task, or BIT for short. I personally shred, er, I mean inspect any ball in the vicinity of the office. Several of my office mates have these foam baseballs on their desk, and I make sure they taste alright. I’m working on my fetching abilities, but my specialty is in chewing and shredding. I don’t mean to brag, but I once found two hidden foam balls and successfully shredded them in less than 30 minutes. I think the ones with the AdamsGabbert logo on them are especially tasty! My favorite is when the humans take a break from work and play with me. Sometimes the recruiting manager Justin will chase me around the office, and when he catches me, he rubs that spot on my belly that makes my feet start moving all on their own! I know I’m doing my job when I see the smiles on their faces. And if I’m really lucky, someone will put a little peanut butter in my Kong Ball. It’s a tough job, but someone’s gotta do it. The humans here are busy helping make other people’s lives better, and someone needs to help make sure they’re happy and staying sane at work. I’m more than happy to step up to the plate!